Okay, so who knew going out of town and being offline for a week equaled the giveaway fairy shinning down on you?? Let me show you what I mean. Right before I left I got word that I had won this from Bee in my Bonnet. Don't you just love those unbelievably adorable cute 30's prints. I am going to have to find a cute project for these. She also sent an adorable pattern with them. Thank you Lori!!! 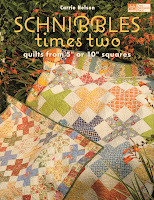 While I was gone I got an email from Sue at Quilt Times that I had won this. I can't wait for it to arrive. I have heard so much about Schnibble patterns but have never had one. I cant wait to whip a few of these quilts out. Who knows, I bet the perfect pattern for those 30's prints is just waiting in the pages of this book. Thank you Sue!!! And lastly, when I got back home, I got word from Darlene at SewCalGal that I was one of the winners of the Golden Quilter Awards. Not one of the winners of the category but one of the winners of the giveaway :) Immediately I started getting excited wondering what I had won. So I headed on over to check the winners list of prizes. Now when I saw this prize, I started jumping up and down and screaming!!! Oh yes, I won the Fat Quarter Bundle of Amy Butler's Soul Blossom prints!!! Ahhhh!!!! Now I am stalking the mailman each day just waiting for it to arrive. Thank you Darlene and Fabric.com (Sponsor of this prize.). I am just thrilled!!! And VIBee Ladies, I am pretty sure this will be my fabric for my month :) Won't it just be perfect!!! Now to find a pattern. Any suggestions for a great Bee month quilt with these amazing prints??? I was wondering when you would react to the winnings. Congratulations on some great fabrics - so jealous! Wow...look at your winnings! Congrats. =) I'd be happy too. WOW! I recently won one giveaway and was beyond ecstatic...I can't imagine winning 3 prizes! WOW! Fantastic wins!! Time to start creating!!!! Wow!! Doin' the happy dance here for you! Can't wait to see what you create. Congratulations! What a lucky ducky you are! Can't wait to see what you make with those! Good grief. You were lucky. You have fabric galore. Congratulation on all your wins. Can I give you some money to go buy a lotto ticket? 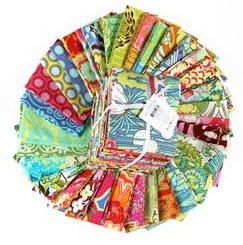 Congrats to you - I noticed you had won one of SewCalGal's prizes, but missed the other 2! Congrats on your wins! I've made one of the Schnibbles quilts, 'X-Rated'. It was supposed to turn out 31" square (IF I followed the pattern, but who ever does that???). I wanted a larger quilt, so, I made mine 7?" x 96". It was fun! I made it for my niece, who graduated college in only 3 1/2 years. Oh my gosh...you lucky girl!! !